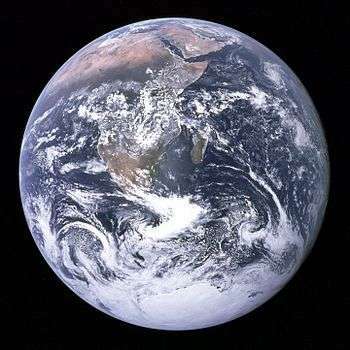 Earth seen from Apollo 17 — the Antarctic ice sheet at the bottom of the photograph contains 61% of the fresh water, or 1.7% of the total water, on Earth. Fresh water is naturally occurring water on Earth's surface in ice sheets, ice caps, glaciers, icebergs, bogs, ponds, lakes, rivers and streams, and underground as groundwater in aquifers and underground streams. Fresh water is generally characterized by having low concentrations of dissolved salts and other total dissolved solids. The term specifically excludes seawater and brackish water although it does include mineral-rich waters such as chalybeate springs. 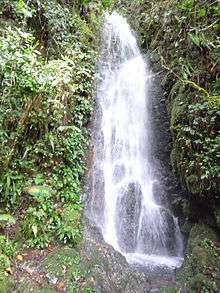 The term "sweet water" (from Spanish "agua dulce") has been used to describe fresh water in contrast to salt water. The term fresh water does not have the same meaning as potable water. Much of the surface fresh water and ground water is unsuitable for drinking without some form of purification because of the presence of chemical or biological contaminants. Out of all the water on Earth, saline water in oceans, seas and saline groundwater make up about 97% of it. 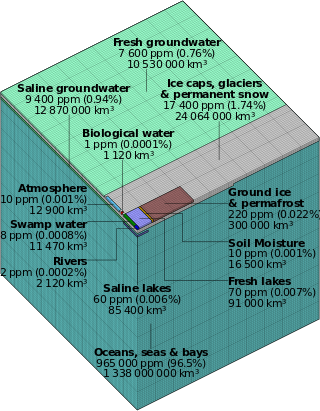 Only 2.5–2.75% is fresh water, including 1.75–2% frozen in glaciers, ice and snow, 0.5–0.75% as fresh groundwater and soil moisture, and less than 0.01% of it as surface water in lakes, swamps and rivers. Freshwater lakes contain about 87% of this fresh surface water, including 29% in the African Great Lakes, 20% in Lake Baikal in Russia, 21% in the North American Great Lakes, and 14% in other lakes. Swamps have most of the balance with only a small amount in rivers, most notably the Amazon River. The atmosphere contains 0.04% water. In areas with no fresh water on the ground surface, fresh water derived from precipitation may, because of its lower density, overlie saline ground water in lenses or layers. Most of the world's fresh water is frozen in ice sheets. Many areas suffer from lack of distribution of fresh water, such as deserts. Changing landscape for the use of agriculture has a great effect on the flow of fresh water. Changes in landscape by the removal of trees and soils changes the flow of fresh water in the local environment and also affects the cycle of fresh water. As a result, more fresh water is stored in the soil which benefits agriculture. However, since agriculture is the human activity that consumes the most fresh water, this can put a severe strain on local freshwater resources resulting in the destruction of local ecosystems. In Australia, over-abstraction of fresh water for intensive irrigation activities has caused 33% of the land area to be at risk of salination. With regards to agriculture, the World Bank targets food production and water management as an increasingly global issue that will foster debate. "If global warming continues to melt glaciers in the polar regions, as expected, the supply of fresh water may actually decrease. First, fresh water from the melting glaciers will mingle with salt water in the oceans and become too salty to drink. Second, the increased ocean volume will cause sea levels to rise, contaminating freshwater sources along coastal regions with seawater”. The World Bank adds that the response by freshwater ecosystems to a changing climate can be described in terms of three interrelated components: water quality, water quantity or volume, and water timing. A change in one often leads to shifts in the others as well. Water pollution and subsequent eutrophication also reduces the availability of fresh water. With one in eight people in the world not having access to safe water it is important to use this resource in a prudent manner. Making the best use of water on a local basis probably provides the best solution. Local communities need to plan their use of fresh water and should be made aware of how certain crops and animals use water. As a guide the following tables provide some indicators. The United States uses much more water per capita than developing countries. For example, the average American’s daily shower uses more water than a person in a developing country would use for an entire day. Las Vegas, a city that uses an extreme amount of water to support spectacular lush greenery and golf courses, as well as huge fountains and swimming pools gets 90% of its water from Lake Mead, which is now at a record all-time low. In developing countries, 780 million people lack access to clean water. Half of the population of the developing world suffers from at least one disease caused by insufficient water supply and sanitation. ↑ USGS – Earth's water distribution. Ga.water.usgs.gov (11 December 2012). Retrieved on 29 December 2012. ↑ Where is Earth's water?, United States Geological Survey. ↑ Physicalgeography.net. Physicalgeography.net. Retrieved on 29 December 2012. ↑ Gleick, Peter; et al. (1996). Stephen H. Schneider, ed. Encyclopedia of Climate and Weather. Oxford University Press. 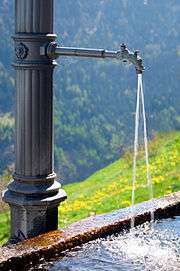 ↑ "Groundwater Glossary". 27 March 2006. Retrieved 14 May 2006. ↑ "Freshwater". Glossary of Meteorology. American Meteorological Society. June 2000. Retrieved 27 November 2009. ↑ "Freshwater". Fishkeeping glossary. Practical Fishkeeping. Archived from the original on 11 May 2006. Retrieved 27 November 2009. ↑ "Vertebrate Kidneys". 3 November 2002. Retrieved 14 May 2006. ↑ Kalujnaia, S.; et. al. (2007). "Salinity adaptation and gene profiling analysis in the European eel (Anguilla anguilla) using microarray technology". Gen Comp Endocrinol. National Center for Biotechnology Information. 152 (2007): 274–80. doi:10.1016/j.ygcen.2006.12.025. PMID 17324422. ↑ Bisal, G.A. ; Specker, J.L. (24 January 2006). "Cortisol stimulates hypo-osmoregulatory ability in Atlantic salmon, Salmo salar L". Journal of Fish biology. Wiley. 39 (3): 421–432. doi:10.1111/j.1095-8649.1991.tb04373.x. ↑ Peter Gleick; Heather Cooley; David Katz (2006). The world's water, 2006–2007: the biennial report on freshwater resources. Island Press. pp. 29–31. ISBN 1-59726-106-8. Retrieved 12 September 2009. ↑ Petroleomagdalena.com. Petroleomagdalena.com (15 January 1999). Retrieved on 29 December 2012. ↑ Nitti, Gianfranco (May 2011). "Water is not an infinite resource and the world is thirsty". The Italian Insider. Rome. p. 8. 1 2 Gordon L., D. M. (2003). "Land cover change and water vapour flows: learning from Australia". Philosophical Transactions of the Royal Society B: Biological Sciences. 358 (1440): 1973–1984. doi:10.1098/rstb.2003.1381. JSTOR 3558315. ↑ The World Bank, 2009 "Water and Climate Change: Understanding the Risks and Making Climate-Smart Investment Decisions". pp. 19–22. Retrieved 24 October 2011. ↑ "Nutrients in fresh water"
↑ "Fresh Water in the Future". Un.org (17 December 2010). Retrieved on 29 December 2012. ↑ Water Aid. "Water". Retrieved 17 March 2012. ↑ Gleick, Peter. "Basic Water Requirements for Human Activities" (PDF). Retrieved 17 March 2012. ↑ Filley, S. "How much does a cow need ?" (PDF). Retrieved 17 March 2012. ↑ Natural Resource Management and Environmental Dept. "Crops Need Water". Retrieved 17 March 2012. ↑ "Canada's Fresh Water". Ec.gc.ca (16 February 2012). Retrieved on 29 December 2012. ↑ "Water Facts". Water.org. Retrieved on 29 December 2012. ↑ "The Drying of the West". Economist.com (27 January 2011). Retrieved on 29 December 2012. ↑ "Water in the Developing World"
Jackson, Robert B.; Carpenter, Stephen R.; Dahm, Clifford N.; McKnight, Diane M.; Naiman, Robert J.; Postel, Sandra L.; Running, Steven W. (2001). "Water in a changing world". Ecological Applications. 11 (4): 1027–1045. doi:10.1890/1051-0761(2001)011[1027:wiacw]2.0.co;2. Moustakas, A.; Karakassis, I. "How diverse is aquatic biodiversity research?". Aquatic Ecology. 39: 367–375. doi:10.1007/s10452-005-6041-y. Richter, Brian D.; Mathews, Ruth; Harrison, David L.; Wigington, Robert (2003). "Ecologically sustainable water management: managing river flows for ecological integrity". Ecological Applications. 13 (1): 206–224. doi:10.1890/1051-0761(2003)013[0206:eswmmr]2.0.co;2.